US homicide rates by firearm are relatively high compared to other advanced countries. In 2012, Unites States had the 19th highest firearm homicide rate in the world (2.83 per 100,000 population). 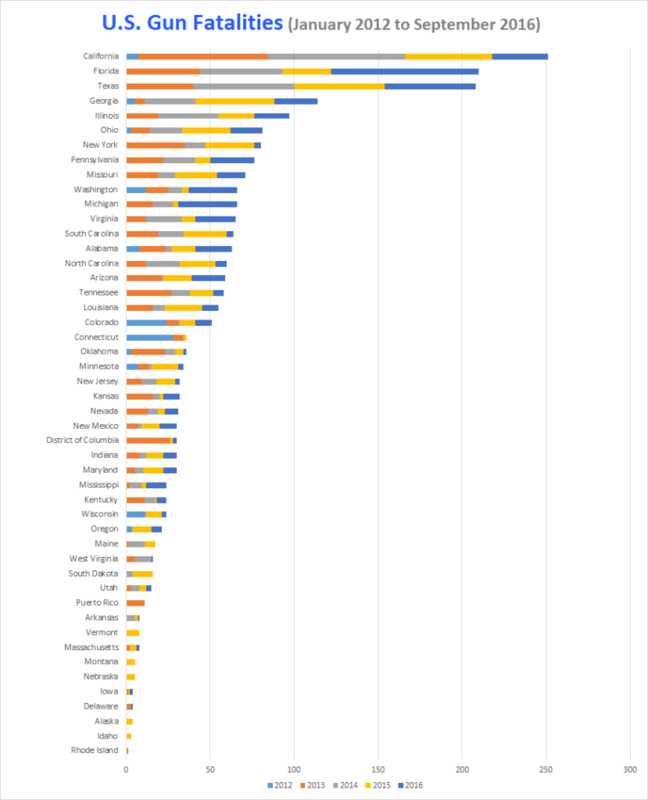 As a comparison, Japan, Norway and UK had some of the lowest firearm murder rates in the world (between 0 and 0.4 per 100,000 people). Over the past 10 years, deaths from gun-related violence, including suicides, murders and unintentional shootings, varied across the USA. Total 1,880 records in the spreadsheet, which includes national gun violence records from 1966 to 2016. You can easily filter the data to customize your analysis. We will endeavour to update this data pack every month. You will need a special code to open the spreadsheet, which will be provided after you follow instructions below. Data obtained from Bureau of Justice Statistics in 2011, shows a total of 478,400 fatal and nonfatal violent crimes were gun-related. 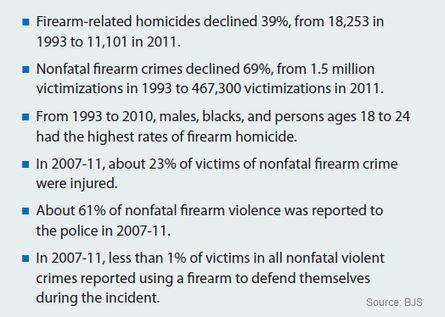 Homicides made up around 2% of all firearm-related crimes. 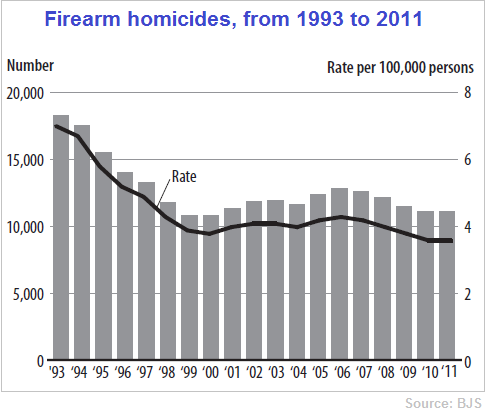 There were 11,101 firearm homicides in 2011, which is a decrease by 39% from a high of 18,253 in 1993. Refer to chart below for illustration of these trends. According to the data, the top 5 states with the highest gun-related death rates were District of Columbia, Louisiana, Missouri, Maryland and South Carolina. According to the Violence Policy Center, the nation-wide gun murder rate was 10.64 per 100,000 people. The following heat map illustrates all firearm violence by state, based on data obtained from the Bureau of Justice Statistics. Using the colour coded map, you can easily find which state has the highest or lowest gun murder rates. Click on the map area to see more details. 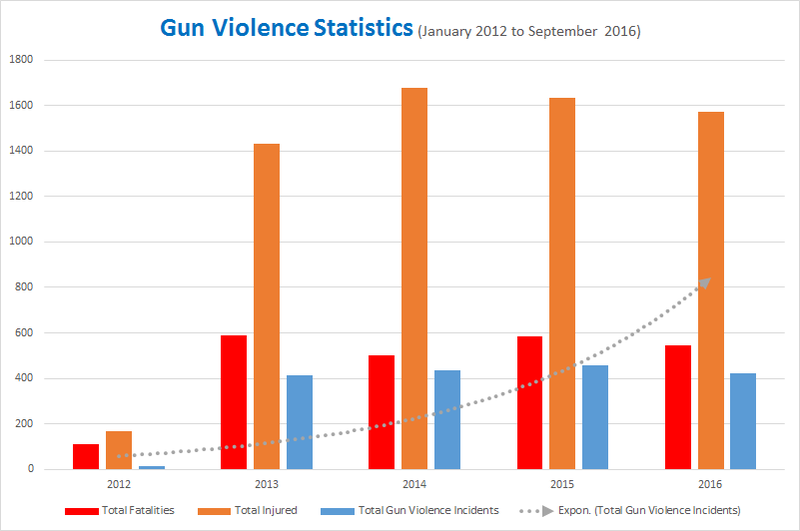 Between 2012 and 2016, the exponential trend line of gun violence incidents have been increasing. Refer to the following chart for illustration. From 1 January 2016 to 30 September 2016, there have been 546 gun deaths and 1,574 gun-related injuries from 423 gun violence incidents in America. Please read the instructions above to download the data used in this article. Comparison between the top 10 states with the highest gun ownership and the top 10 states with the highest gun deaths indicates Mississippi being the only state that might have a direct relationship. The remaining 9 states didn’t have any indication of co-relationship. Comparison between the top 10 states with the lowest gun ownership and the top 10 states with the lowest gun deaths shows Hawaii being the only state that might have a direct relationship. The remaining 9 states didn’t have any indication of co-relationship. However, some crime experts believed that the weaker the gun laws and the higher the rate of gun ownership in a given state, the more deaths from gun violence that the state will have.